SAY CHEESE! A photography tool designed especially for children! 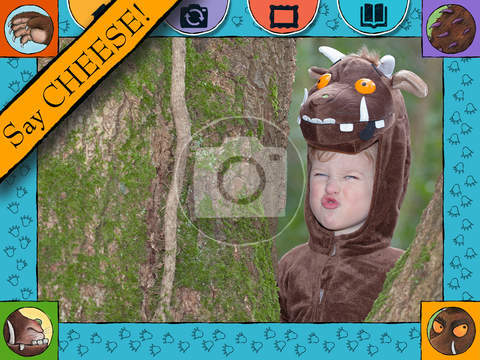 'Gruffalo: Photo' is a safe activity app designed to get children having fun outdoors, inspiring them to explore the forests and green spaces around them. 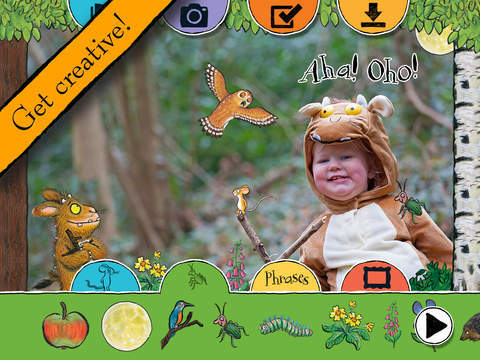 With no in-app purchases 'Gruffalo: Photo' is simple to use and specially developed to encourage creativity in children of all ages. 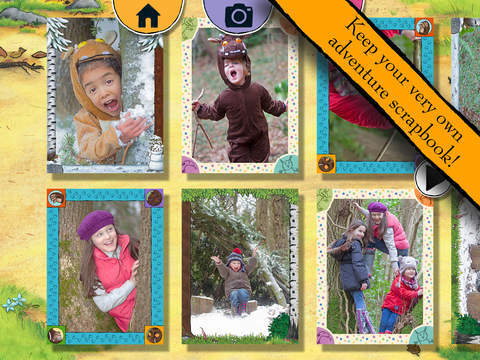 • Photograph your adventures using exclusive frames, you can even take a woodland selfie! 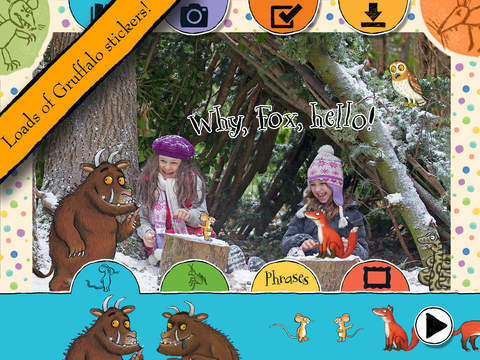 • Personalize photos with Gruffalo stickers and phrases! • Import photos from you iPad or iPhone's gallery letting you customize even more pictures! 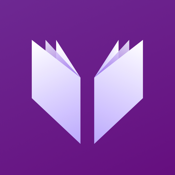 • Packed with fun ideas for things to do! 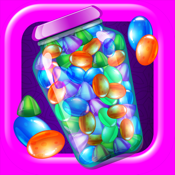 • Great parental features including photo save limits and a hidden delete function. All photos are stored on the app, not in the device’s gallery. 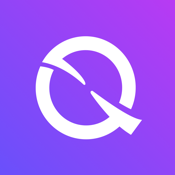 • No way for kids to accidentally tag, message or print photos – completely secure. 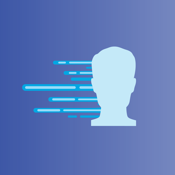 To turn on the ability to delete, download and import photos to your device's gallery simply go to the Parents' Page, click the settings cog in the bottom left hand corner and turn on the features you want to have visible. When turned on these buttons appear on the Sticker Book (for delete/import) and individual picture editing pages (for export). Based on ‘The Gruffalo’, the classic children’s picture book written by Julia Donaldson and illustrated by Axel Scheffler. 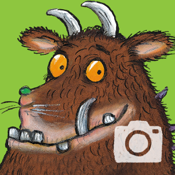 'Gruffalo: Photo' is brought to you by Magic Light Pictures, producers of the Oscar nominated animations 'The Gruffalo' and 'Room on the Broom' as well as 'The Gruffalo's Child' and 'Stick Man'.